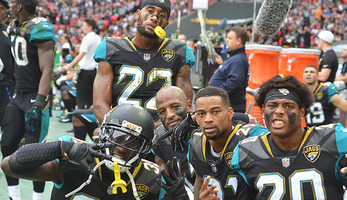 2018/19 English Football League Thread (Not Premier League)..
Jacksonville Jaguars Fan Forums Other Stuff All Sports Forum 2018/19 English Football League Thread (Not Premier League).. The top two teams in The Championship gain automatic promotion with one team advancing via the playoffs. The bottom 3 get relegated to League One. The same occurs with League One but with 4 teams getting relegated to League Two, and League Two has 3 teams promoted automatically and 1 via the playoffs.. The bottom 2 teams in League Two get relegated to the National Conference which is referred to as non-league or semi-pro, then one team gets promoted from the National Conference to League Two and 1 via the playoffs. The 3 Football League Teams have 72 football teams in total, some of which you guys may recognise if you're a keen English football follower as there are some really big teams outside of the Premier League. In this thread I won't include the FA Cup, League Cup, Football League Trophy or National Conference fixtures/results as a whole but I will include upsets and surprise results whereby a Football League team knocks out a Premier League team etc.. I also see no need to include every fixture and result throughout the league season, but I will include talking points from all 3 divisions. So here's a little bit about my main team. My team are Swindon Town FC, we play in League Two and had one solitary Premier League season back in 1993/94, we're based in Swindon Wiltshire, and have a stadium which holds around 15,000.. however, it's rarely full (only when we have a cup game against a big Premier League team or local rival). Our attendances generally tend to be around 7,200 sometimes more or less depending on opponent and how well our season is going. This year we've made some excellent signings and I'm hoping for at least a playoff berth. We also made a very controversial signing with a player called Luke McCormick. He is a 35 year old Goalkeeper who has served time in prison due to death by dangerous driving and driving whilst under the influence of alcohol which resulted in the death of 2 young children. This signing has divided the fanbase somewhat, but we have been reassured that he is literally in for the number 2 spot. I won't put my personal opinion on the signing on here, I don't see the need. We have 3 main rivals in Oxford United, Bristol Rovers and Bristol City with Oxford being the bitterest. I hope you all enjoy the upcoming season, I know I will and won't in equal measures! I know right.. we had some brief success with Paolo Di Canio as our manager but that didn’t last.. It looks so wrong to see Stoke in this thread. So, the English Football League starts this week, a week before the Premier League. *All relegated from the Premier League last year. *2 sets of supporters who like to cause trouble from time to time.. I'd expect there to be a bit of trouble at or around this game.. I always liked Wolverhampton just because of the logo. I wish I had more time in life to add another sports team to follow but I feel as though I'm maxed out. I've got the Jags and I follow the major sports for my university plus I dig the 5 major golf tournaments. And I like watching the US mens national soccer team. Just dont feel like I can allocate more time than that to other teams. Anyways I know the Wolves were promoted up to the premier league this year. Hopefully they can hang around for awhile before getting sent back down. I'm 80% likely to head to London for the Jags game this year which should be fun. So if I do, of course I'd check out the Fulham game. Too bad they arent scheduled for Man U or Arsenal or somebody like that. Or better yet the Wolves! But should be fun nonetheless. I was in Scotland at the end of May and I landed the day of the Scottish Cup (I think it is called). Essentially the scottish version of the FA cup final. Celtic vs Motherwell. Was gonna try to get a ticket but it's surprisingly difficult. I guess they dont like selling soccer tickets on stubhub over there. Anyways I would have been able to get a ticket if I bought through Motherwell and showed up at their home ticket office but the timing just didnt work out. Wasnt much of a game as Celtic crushed them. But I was in a celtic pub in glasgow and they seemed pretty stoked. good time. (08-01-2018, 08:16 AM)rfc17 Wrote: I always liked Wolverhampton just because of the logo. I wish I had more time in life to add another sports team to follow but I feel as though I'm maxed out. I've got the Jags and I follow the major sports for my university plus I dig the 5 major golf tournaments. And I like watching the US mens national soccer team. Just dont feel like I can allocate more time than that to other teams. Luckily, we had the month of June & July off to re-energize for 2022. I took my son to the Swindon game as it was the first game of the season.. so, Swindon were by far the better team which resulted in Macclesfield going 1-0 up. Almost instantly from the kick off, Swindon went and equalised. About 15 minutes later Macclesfield went ahead again at 2-1 and that was that.. or so we thought. When ensued was the most sublime and ridiculous game I've been to for as long as I can remember. Swindon hit the post and crossbar a ridiculous amount of times.. the Macclesfield goalkeeper made some excellent saves and some shots just didn't go our way. Then, the fourth official indicated there would be 5 minutes added on.. so Macclesfield (still 2-1 up) thought they'd waste time.. the referee stated that he would be adding this on to the end of the game.. in the 95th minute, Swindon were given a penalty.... scored! Nothing less than we deserved.. great way to end the game? 2 minutes later, Swindon were given ANOTHER penalty... SCORED!! Imagine the scene.. dead and buried and over allotted time losing 2-1... 3 insane and bizarre minutes later and we've won the game 3-2!! damn... see that is why I wished they had a channel that televised lower league games over here. We get the PL and some la liga but it is awesome to watch teams that don't have some 80mil player who ends up being the focal point(at least that is what I end up watching) during a match. I streamed the Sheffield United game and even though I was disappointed they lost it was still a fun game to watch. (08-08-2018, 03:54 PM)JagsorDie Wrote: damn... see that is why I wished they had a channel that televised lower league games over here. We get the PL and some la liga but it is awesome to watch teams that don't have some 80mil player who ends up being the focal point(at least that is what I end up watching) during a match. I streamed the Sheffield United game and even though I was disappointed they lost it was still a fun game to watch. I haven't looked into the link below but perhaps there is a league pass ?? I did subscribe to the PL for $50/season which is extremely cheap. I'm not sure how it works, I believe that you sign up for a particular team and overseas fans can watch/listen to the games live and on demand plus watch extended highlights and interviews etc..
(08-01-2018, 08:16 AM)rfc17 Wrote: I always liked Wolverhampton just because of the logo. I wish I had more time in life to add another sports team to follow but I feel as though I'm maxed out. I've got the Jags and I follow the major sports for my university plus I dig the 5 major golf tournaments. And I like watching the US mens national soccer team. Just dont feel like I can allocate more time than that to other teams. Anyways I know the Wolves were promoted up to the premier league this year. Hopefully they can hang around for awhile before getting sent back down. Wolverhampton is a 20 minute car ride from where I live and a LOT of the people around here support Wolves (including my wife’s family). So I’m going to have a struggle stopping my son supporting them too! They’re a club with a great history (although it’s been a long time since they were winning the top division) and a great fan base. Stadium is pretty smart too, although showing it’s age a bit in places. If you ever go (and it’s only a couple of hours on the train from London...) you have to buy a Balti pie outside the ground and maybe go for a curry afterwards. That’s more like it, a three-nil away win at QPR is just what we needed (even if it’s a struggling QPR at the moment). We drew 2-2 with Crawley having gone down to 9 men on Tuesday, then 1-1 with Forest Green Rovers... not the start to the season we wanted! (08-26-2018, 05:42 AM)DarloJAG84 Wrote: We drew 2-2 with Crawley having gone down to 9 men on Tuesday, then 1-1 with Forest Green Rovers... not the start to the season we wanted! Seems funny we are even talking about Crawley and FGR being in the league.